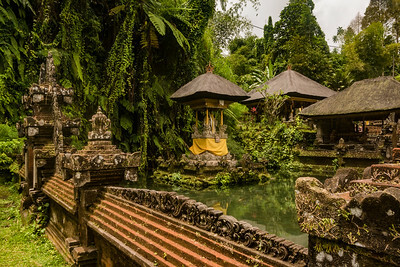 Pura Taman Saraswati temple in Ubud (Bali, Indonesia), right behind the Starbucks, of all places. 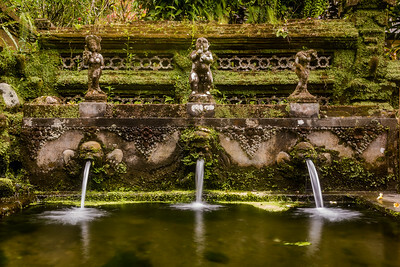 This is a popular location for locals as well, it's beautiful location you'd easily miss in busy Ubud centre if you didn't know it was there. It gets really busy here, so if you want a shot without people in it, be early as I did here. Some evenings they have performances here as well, traditional Balinese dances, but the complete performance is done by women, contrary to tradition. 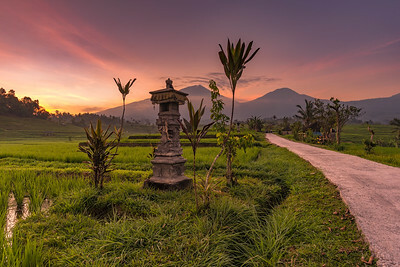 Doesn't get much more Balinese when it comes to landscape photography, the ricefields and majestic Mt Agung, ready to explode at any moment. It was such an exciting time for me, being in Bali for 2 months with one of the most amazing volcanos on the planet, ready to explode. I can't think of anything more exciting to capture, so I had the time of my life driving around, shooting time lapses, hoping to capture that moment. It never happened though, but at least I got some great footage of Mt Agung, among this shot seen from Maha Giri hotel, south of Mt Agung. 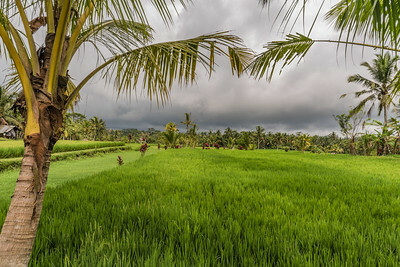 Somewhere west of Ubud, in the middle of the fields where locals farm their herbs and vegetables, driving on narrow roads, waving at surprised faces of locals who barely ever see a foreigner there. 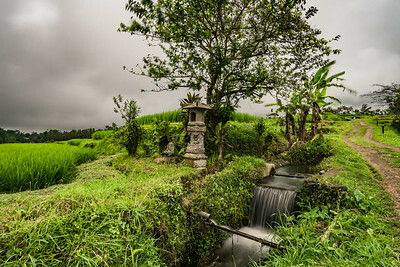 I love to drive around following the small paths and Bali is just such a great place for that. During sunset I took my Mavic drone out and found this nice little shed. I love that about my drone, I get to shoot find locations I'd never find otherwise, shoot from viewpoints I could never reach. Sunset at Jati Luwih rice terraces in Bali, Indonesia. Capturing a sunset at this fabulous location turned out to be one of the biggest challenges, only beaten by trying to capture the Milky Way here, in which I never succeeded. 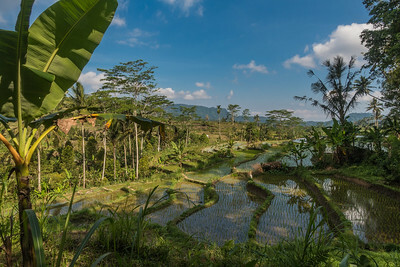 These Jati Luwih are a Unesco World Heritage site, thanks to their endless shades of green, they are by far the most incredible rice terraces of Bali. 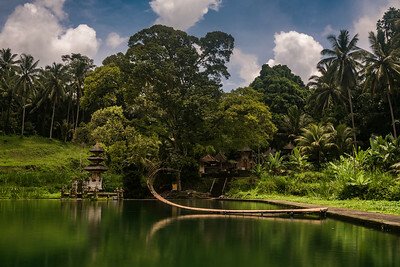 Most people flock to the small Tegalalang rice terraces near Ubud, pretty, but an overcrowded tourist trap compared to Jati Luwih. If you visit this place, you should spend an hour at least wandering through the fields, there a few walking paths and even long treks available here. 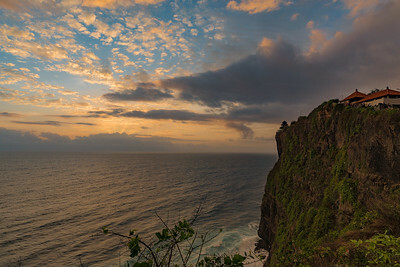 Sunset at Ulu Watu temple, south Bali, Indonesia. 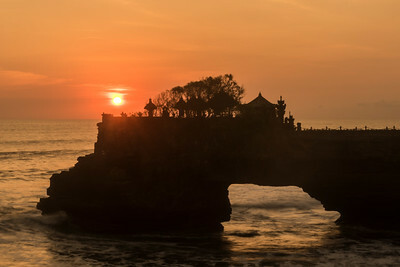 This famous location is everyone's list and is easily one of the most visited tourist spots, in particular during sunset, when there is a Balinese dance performance with this view as a backdrop. Not bad huh. The place gets so crowded, but if you can accept that, the reward is great. This temple is notorious for its thieving monkeys, you are warned there, but take is serious. I have seen them steal wallets, earrings out of ears, sunglasses especially and one even had his hand in my pocket. 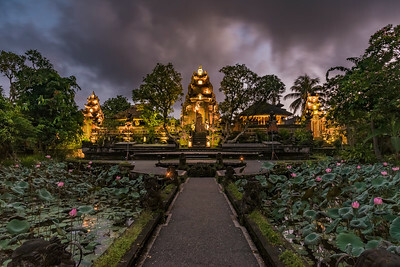 Pura Besakih, 'mother temple' of Bali, is the most important, the largest and holiest temple of Hindu religion in Bali. 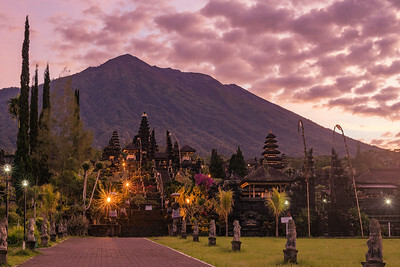 Set nearly 1000 meters up the side of Gunung Agung, it's an extensive complex of 23 separate but related temples, the largest and most important being Pura Penataran Agung. When I shot this image, the alert level was at its highest, roads were blocked and there were locals and police at checkpoints and driving to around to make sure no one else but residents were there. But at 5am in the morning no one was there, so I was able to drive up to Pura Besakih and shoot it without anyone there, except dozens of barking hungry dogs, kinda scary. A rare thing to find this place so desolate, because this busy temple probably hasn't been empty since the last eruption in 1963. 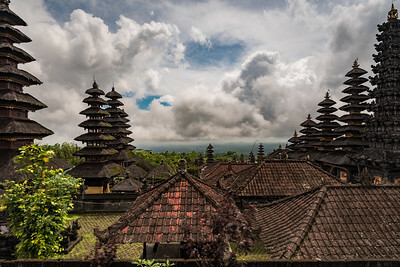 View from one of the temples at Pura Besakih, the mother temple of Bali, Indonesia. 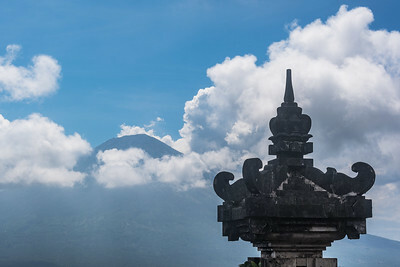 This temple, at the slope of Mt Agung, was in the evacuation zone during the threat of eruption. I was able to drive here a couple of times though, also one being escorted out by police shortly after. During this particular time there was a police officer and no one was allowed up the temple. So I just sat down with the local guys/guides and chatted with them. Later they convinced the cop to take me up anyway and one of the guys took me up and let me shoot some timelapses and even fly my drone. 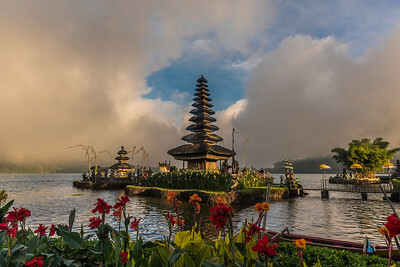 Ulun Danu Beratan temple, the 'temple on the lake'. 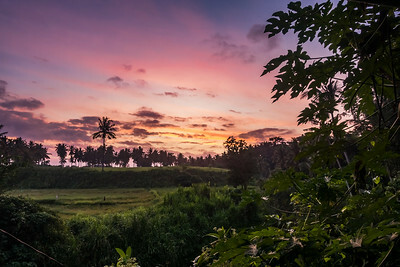 This truly is one of Bali's most scenic attractions, in particular at the end of the day when the sun starts setting and the colors of the clouds change. Situated high above sea level, clouds roll over the lake most of the day. 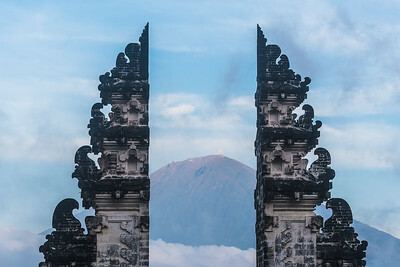 Temple detail with Mt Agung in the back, shot at Pura Lempuyang Luhur temple in Bali, Indonesia. 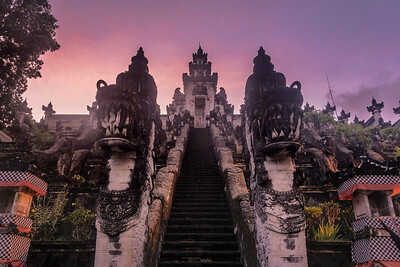 Pura Lempuyang Luhur temple in Bali, Indonesia. 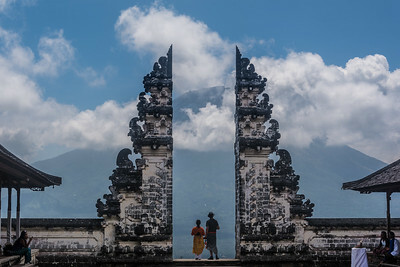 This temple has become quite famous thanks to Instagram, the entrance with Mt Agung as a backdrop is an ideal photo location. Mt Agung is mostly covered in clouds, so come early if you want to capture it. This is shot at the entrance of the first temple, there are 6 in total and it's quite a hike to get to the top. 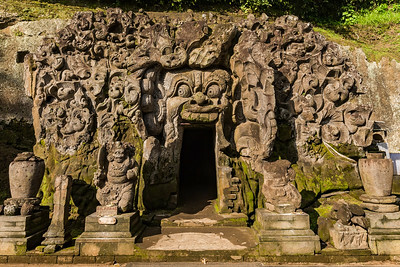 Elephant Cave at Ubud, Bali, Indonesia. This seems like an easy shot, but I tell you capturing this without any people in it turned out to be the hardest thing ever. I returned here 4 times to capture it, in light that wasn't too bad and without all the festival thingies in front of it. But this cave is so popular, there are literally constantly people walking in and out and posing in front of it. I actually took a timelapse of it as well, which shows it perfectly! I was able to extract this frame which for a brief moment had no one in it. Don't expect it to be like this though! Jatiluwih ricefields in central, Bali, Indonesia. 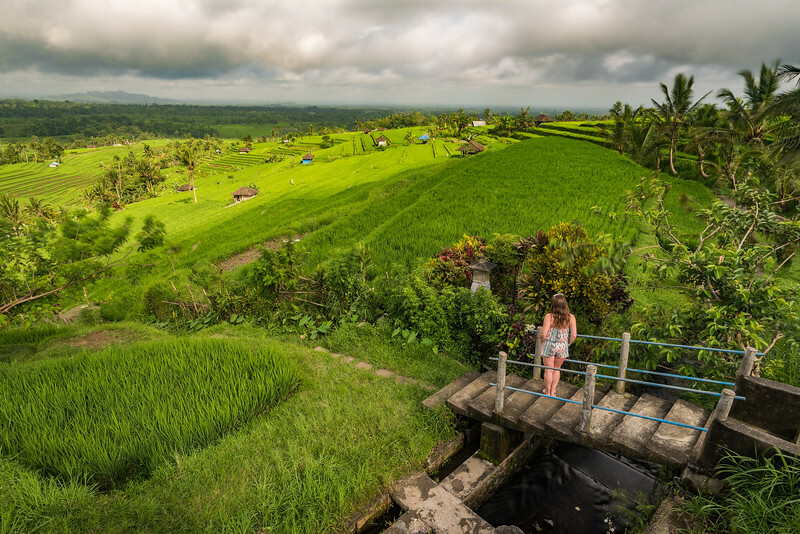 These Unesco rice terraces are among the most beautiful in the world, there are a few walking paths to stroll through them, one of the best walks in Bali! If you find it on a sunny day, feel lucky, somehow this place is almost always clouded. 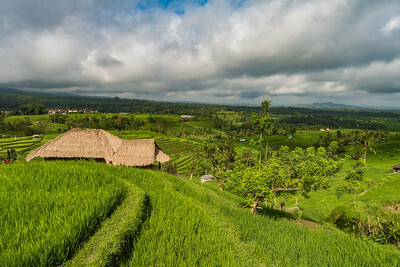 Rice terraces near Sidemen, Bali, Indonesia. Sidemen town and the area around it are becoming more popular as a place to stay, but the area has been famous for its gorgeous scenery for a long time. 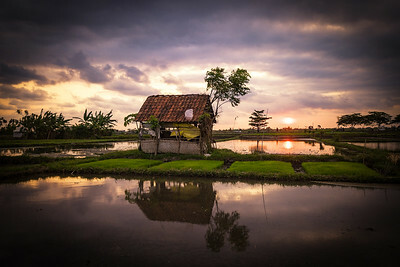 It's a great place to explore Bali off the beaten track, walking through the rice paddies or driving around on a motorbike doesn't get much better than here. 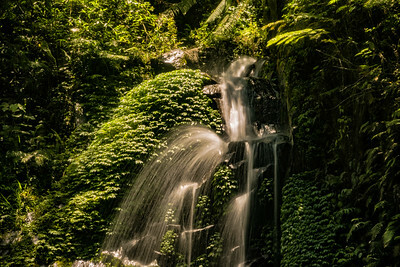 Banyumala waterfall in the north of Bali, Indonesia. 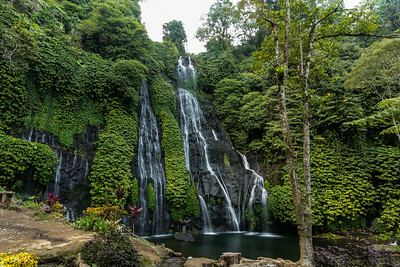 Located near Munduk you'll find signs to a bunch of waterfalls, this one, Banyumala waterfall is one of the best. Water gushing down in many small streams, this place is wonderful to relax and swim. It's a bit of a hike back up, but at least it's worth it! Come at sunset to find everyone leaving and having it (almost) to yourself. 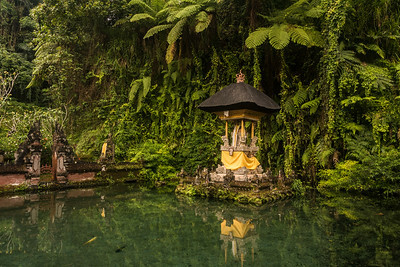 Gunung Kawi Sebatu temple, Bali, Indonesia. Bali has many, many temples, but of all, this is my favorite. 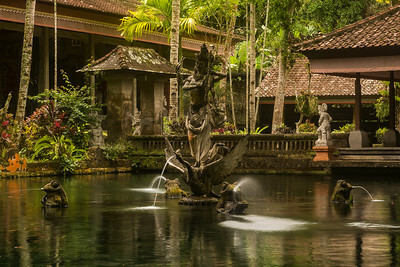 Such a small, pretty, quiet temple, this is such lovely place to wander around and look at all interesting details, fish swimming in the ponds, faces spewing water, locals washing themselves, such an interesting location. Altough sometimes buses might drop off loads of tourists, this place is usually very quiet and remains one of Bali's best kept secrets. 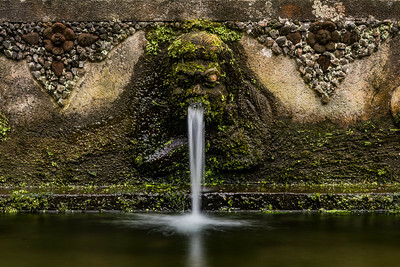 I shot at the Nungnung waterfall in Bali, Indonesia. It's a detail of the opposite side of the waterfall, the only other interesting thing I could photography, since all the waterspray coming from the waterfall, made it impossible to get a decent shot. Everyone was struggling. The waterfall itself is stunning, one of the best I've seen. 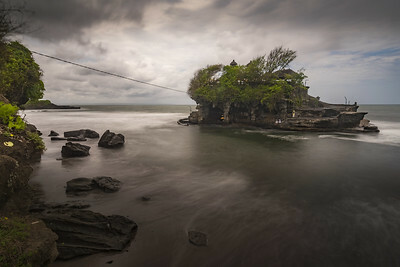 Tanah Lot temple, Bali, Indonesia. This was shot during high tide when the temple can't be reached. When the tide is low you can walk to the temple, plan your visit accordingly! I went at this time so there wouldn't be any people in the shot. This is a blend of many frames I shot as a timelapse. By stacking and blending the 200 images I was able to make the rough water smooth as silk. Temple on the arch at Tanah Lot, Bali, Indonesia. 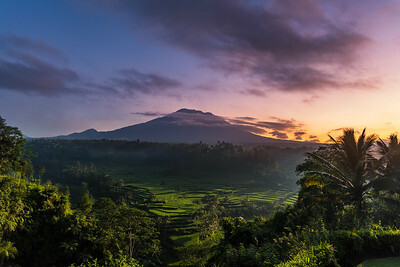 Frame from my timelapse shot near Ubud. I tried to capture a day to night timelapse, but light polution and especially dew proved to be spoilers, time and again. 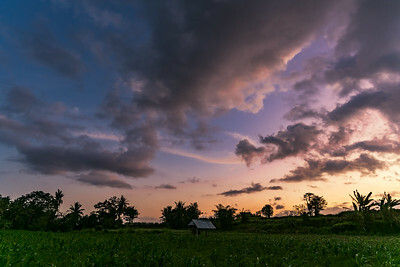 This was the best moment of that sunset, shot in the farming fields west of Ubud, between local guys washing themselves and laughing together.